1. Open lid half way, and add soup base. 2. Pour room temperature water up to the inside line. Microwave for 5 minutes. 4. Leave the noodles in the microwave for 1 minute to cool. Stir well and serve. 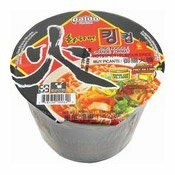 Ingredients: Noodles: Wheat Flour, Palm Oil, Modified Potato Starch, Salt, Guar Gum, Potato Starch, Emulsified Oil (Glycerin Esters Of Fatty Acids, Soybean Oil), Sodium Carbonate, Potassium Carbonate, Riboflavin. Soup Base: Salt, Monosodium L-Glutamate, Sugar, Red Pepper Seasoning (Red Pepper, Salt, Garlic, Glucose), Roasted Red Pepper Powder (Red Pepper Powder, Red Pepper Oil), Soy Sauce Powder (Soy Bean, Wheat, Salt), Red Pepper Seed Oil Powder, Soy Peptide, Black Pepper, Ginger Powder, Paprika, Disodium 5-Guanylate, Caramel Powder. Dried Vegetables: Green Onion Flake, Red Sweet Pepper Flake, Seaweed Flake. Simply enter your details below and we will send you an e-mail when “King Instant Noodles Bowl Hot & Spicy (韓國火碗麵)” is back in stock!